Now the Windows world has a trashcan PC to call its own. Except this one looks much, much cooler than Apple’s Mac Pro and it has enough power to satisfy the biggest PC gaming fantasies. The VR-ready Vortex “gaming cylinder” is now available, MSI recently announced. 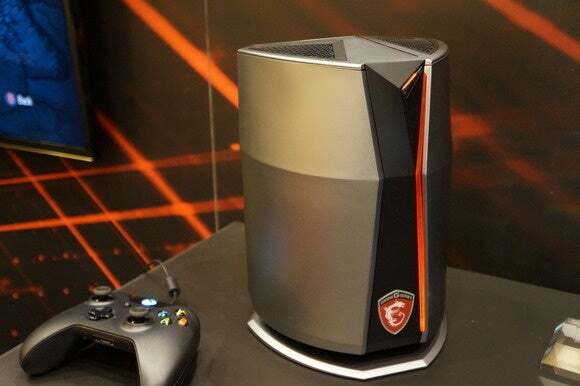 The Vortex measures 10.5-inches tall, which MSI says is about the size of a sub-woofer. Packed into that tiny package, however, is a whole lot of super-powerful guts. The PC is powered by up to a 4.0GHz Intel Core i7-6700K, 64GB DDR4 of RAM, dual Nvidia GeForce GTX 980 graphics cards, and a Super RAID 4 set-up for onboard storage. The impact on you at home: The Vortex is available now from various online retailers. You can find a complete list on MSI’s Vortex page. Prices for the stub-sized powerhouse start at $2200. If you’re interested in using it for VR gaming as well as traditional PC gaming, getting it delivered in time for day the Oculus Rift launch later this month depends on when and from where you order it. At this writing, Amazon quoted a ship time within two to five weeks, B&H said the device was coming soon, and Newegg had the PC in stock. All that power translates into some pretty impressive tricks. MSI’s li’l bucket can support up to six simultaneous video outputs. 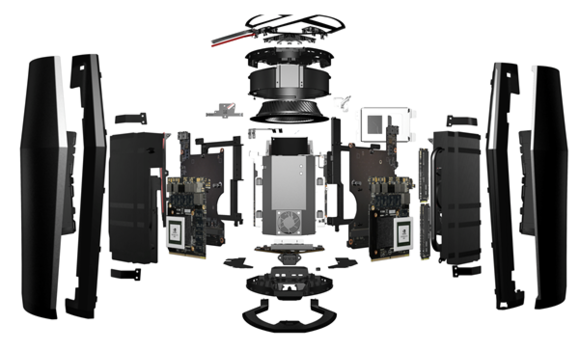 It’s 4K ready of course, and will have no trouble powering that Oculus Rift or HTC Vive. Online gamers will also be pleased with the Vortex’s addition of Killer DoubleShot X3 Pro connectivity. That setup means less lag when you’re shooting baddies on the quarantined streets of New York while simultaneously streaming your glory live on services like Twitch. There’s also a mobile app for Android and iOS allowing you to adjust your machine’s performance from your phone. And then there’s why this thing is called the Vortex to begin with—it’s cooling. 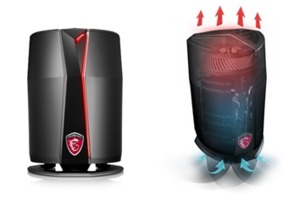 MSI says it loaded the Vortex with the company’s 360-degree Silent Storm Cooling technology. The system, according to MSI, “creates a vortex-shaped wind path” by taking heat from the bottom of the machine and moving it up and out of the unit. So yes, the Vortex takes its name from the cooling system. If it makes you feel better, you can just pretend it’s called the Vortex because of the gaming mayhem the system brings into your home.